Pi-day, the perfect day for pie. While this post is pretty belated, we did celebrate on the appropriate day – for science, of course! This time, how does pie plate material impact the finished pie? Initial observation: In previous browsings of the internet, and doing research on pie plates, we ran across this post at The Cookie Scoop regarding some pie baking anomalies. 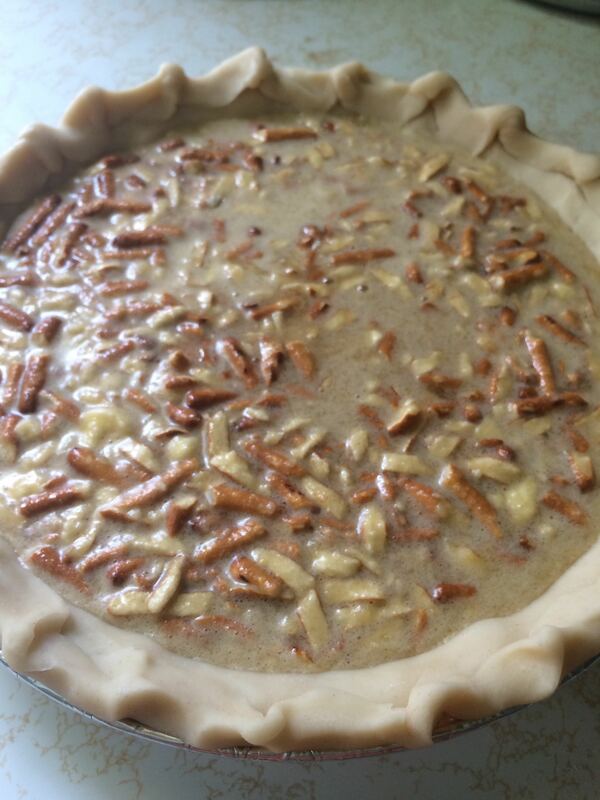 It was noted that pecan pies baked in a glass pie pan were more done than those baked in a disposable Aluminium pan. The author suggested that it was due to the glass distributing the heat more evenly leading to a pie that finished sooner. Question: Was the observed effect really due to better heat distribution? Pyrex glass is less thermally conductive compared to metal (1.005 W/m∙K versus 205 W/m∙k), so the proposed explanation does not sit right. One thing that came to mind from previous experiments was that pie plates can have surprisingly different volumes, so perhaps that comes into play. Expectation: pie filling thickness will vary depending on the pie plate, and that might impact doneness. It is not expected that pie plate material itself will have an impact during baking. due to tree nut allergies of one of our tiny taste testers, the pecans were replaced by 80g (~1 cup) of crushed pretzels per pie, which turned out to be pretty darned tasty. NOTE: the small 9″ pyrex and the 10″ Aluminium vessels have the same volume! While the main label on the Al pan says 10″, the measurements are given as 9 + 3/4″ x 1 + 3/16″. Actual measuring shows that it is 9 + 5/8″ rim to rim but with only 8 + 5/8″ upper / 7″ lower diameters available for filling. Filling thickness did vary, but not by much. The large pyrex pan had a filling thickness of 2cm, and the other two pans each contained 2.2 cm of filling. A secondary hypothesis was that due to the insulative differences between pyrex and aluminum, perhaps there were different cooling rates after the pies came out of the oven. The table below contains temperature measurements (°F) recorded at different times after the pies were done baking. First time is “approximately zero” due to the logistics of moving 3 pies to cooling racks. Conclusion: A taste test indicated that the pie in the Aluminium pan was the best (most properly done), while the other two were noticeably chewier (likely overdone). This is essentially in-line with what the Cookie Scoop noticed, if everything were shifted to a more-done state. The filling thickness was the same in each of the smaller pans (9″ pyrex & Al), yet there was still a noticeable difference in doneness. In this case, we can rule out filling thickness as a reason, but the table above might offer a reason. The pie in the Aluminium pan cooled off faster. As noted often by Alton Brown, carry-over is a thing that needs to be accounted for, and insulative materials will keep the pies warmer for longer. Instead of more even heat distribution, it is suggested here that by being less conductive, and more thermally insulative, the pyrex pans hold heat in the pie for longer after removal from the oven and continue to cook the pie. The difference in conductivity can have a distinct effect when prebaking pie shells, but a variety of bakers online have determined that there is little difference when baking filled pies. 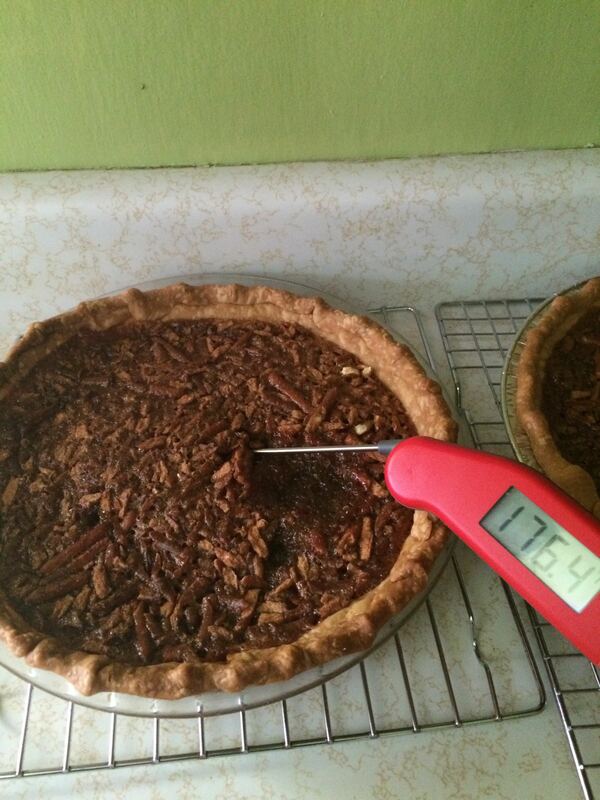 Testing internal pie temperatures during cooling. Future Questions: The continued cooking while cooling does not explain the observation made on The Cookie Scoop that the pie had a different consistency while still in the oven. The disposable pans used in the above trial were very flexible; could it be that the flexibility of the pan might affect the test for doneness? Would a rigid metal pan reduce the in-oven-jiggling but still cool quickly enough to result in a potentially under-done pie?